Can you make Kombucha with honey? Raw honey, even? A few weeks back, when showing you how to divide a scoby — the Kombucha mother culture — I mentioned that we make our Kombucha with honey instead of sugar. Many were intrigued and wondered if this was really possible. However, since I received many questions about this, this week I'm devoting #AskWardee to sharing the particulars… Check them out below in print, podcast, or video. The Question: Can You Make Kombucha With Honey? Many of you asked me to share more information about how we make our Kombucha with honey. I'm happy to share more! Today, I'm going to tell you how to make Kombucha with honey — even raw honey. First, though, let's answer the three big questions looming over everyone's heads! #1 — Because Raw Honey Is Anti-Microbial, Won't It Interfere With The Ferment? When by chance honey is mixed with water, fermentation happens. Yeasts surfing through the air aboard particles of dust find their way to that sweet, nutritive honey-water. When the honey is pure, it acts as a preservative and inhibits microscopic life. But honey diluted with water becomes a stimulating medium for airborne yeast to land in, feast upon, and reproduce exponentially, bubbling and vividly alive. So, there you have it — diluted honey provides sweetening and does not interfere with fermentation. #2 — Why Would You Make Kombucha With Honey, Anyway? Most people make Kombucha with white sugar or evaporated cane juice — aka table sugar. It's dissolved in a sweet tea. The mother culture (the scoby) eats the sugar in the sweet tea while it produces beneficial acids and proliferates to create the bubbly, delicious, fermented beverage we call Kombucha. And even though most of the sugar gets consumed during the fermentation, not all of it does. Whatever amount is left is too much for us. We don't want to eat any table sugar. We'd much rather have honey, because honey is allowable on a gut-healing diet such as GAPS. While we are technically not fully on the GAPS diet, we do still avoid sugar to maintain our gut health and for other benefits (weight management, energy, etc.). So personally, we prefer to use honey for our Kombucha for this reason! #3 — Should You Use A Jun Scoby? Yes, you can use a jun scoby for your honey-brewed probiotic beverage. Turn off heat. Cover and let steep for 10 minutes. Add some cold water to bring the temperature down. Pour into your fermenting vessel that contains the scoby and some finished Kombucha. Add remaining water to fill vessel. Cover and ferment as usual. (Optional) If desired, do a second ferment to add flavor and increase bubbles in bottles like these. You'll notice I call for 3/4 cup of honey per gallon, while usually Kombucha calls for 1 cup of sugar per gallon. Honey is sweeter, so less is needed. Although I had no trouble simply switching from sugar to honey, it's possible that your scoby may take time to adjust. …give the honey Kombucha extra time to ferment fully as the scoby adjusts to the new food source. …split your scoby and keep making Kombucha the usual way while you also start a batch with honey. Bonus Tip For Trim Healthy Mamas! If you're a Trim Healthy Mama, ferment your Kombucha until it's quite sour — either a first or second ferment — then “sweeten” to taste with liquid stevia! Where To Buy Bottles — if you want to do a second ferment for bubbly, flavored Kombucha! Where To Buy Liquid Stevia — if you have sour Kombucha that you need to “sweeten up” without sugar! Do you use honey for Kombucha? Why and how? What tips would you add? Does the taste of honey kombucha differ from that of sugar kombucha? Naomi — If it’s a mild honey, not much different, though perhaps a tad more rich/flowery. If the honey is a strong flavor, like blackberry, it does have more of a fruity/floral flavor. We like the additional flavor from any type of honey very much! I was wondering where you get your honey? My brother is a bee keeper and even buying it from him would put me in the poor house if I used it for my kombucha. I already use it when I make green tea with lemon & honey as an alternative to the Arizona brand in a can. I always buy it raw! I don’t have a Costco membership but a close friend does. I will check the prices there. Thank you! I love watching your videos! Also, about the bottles. I made my son in law drink Grolsch for awhile since he is a beer drinker, then we just didn’t return the bottles for deposit. There is also a liquor store that has agreed to save them for me. I am in Michigan and they have a deposit of 10 cents a bottle. I will just pay them the deposit. I have been using GT bottles that I saved and run through the dishwasher, but the little seals inside the caps are wearing. A gallon makes about 6 bottles. I do 2 gallons at a time so I am hoping to acquire about 25 bottles. That way I can still have some in the fridge when I bottle the next batch and that gives me a bottle to enjoy each day! The replacement seals are available online from home-brewing sites as well as Amazon. I’ve had my scobys in kombucha in the fridge for months. I seldom replenish the tea. I’ve tried making new batches of kombucha with these scobys and they do regrow slowly, but the tea always tastes pretty vinegary. Should I buy a fresh scoby or work with the honey/sugar ratio. I’ve never. Even successful here in the San Francisco area making kombucha. I use filtered tap water… maybe that’s it?!? Is your water reverse osmosis? This could affect your scoby. Usually a vinegary kombucha results from brewing too long. Kombucha can be brewed from 7 to 30 days. Longer brewing results in less sugar and a more vinegar flavor. Temperature can also change the brew time. Warmer weather can result in a quicker brew. You could try tasting your brew at 7 days and then stopping when it reaches the flavor you like. If I transition a regular scoby to honey and green tea, will it start producing 2% alcohol instead of .5%? We are actually not sure about this. We suspect that it’s the mother culture that makes the higher alcohol content, not the honey. But we haven’t seen any evidence either way. Can I use a Scooby from kombusha to make Jun? No, you need a Jun scoby to make Jun. I looked at the link you provided for bottles, but I prefer 16 oz bottles for my Kombucha. Do the bottles have to be specifically for kombucha, or can I use these bottles that say they’re for beer? 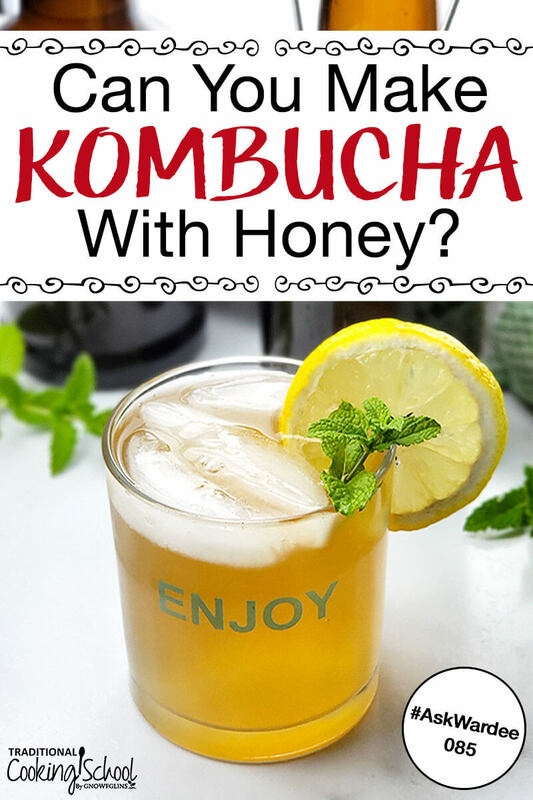 Wondering… In this honey Kombucha recipe it says to use 1/2 C of loose tea, but in the original recipe it says to use 2 tablespoons loose tea for a gallon of Kombucha. Is there a misprint here? I am so glad to get the info on using honey instead of sugar. I had been getting organic sugar but have not had an issue with sugar being left over because I prefer to let my kombucha ferment longer than 7days. I have let it go up to 21 days. I use mine more medicinally and add herbs in the second ferment, sometimes fruit when I find a good sale or have dried fruit on hand. It has a tendency to have a strong flavor and I have to cut it for family members. I had issues with a bad shoulder and was using kombucha as a means of getting more herbs without just drinking tea and green smoothies. I am currently in a food dessert in Chicago, IL and am lucky to find organic sugar [and I have a tendency to suspect that]. It is nowhere near the offerings in Minnesota. I am looking forward to trying with honey once I get my hands on some. I think I would like to try buckwheat honey! It was great in a cough remedy I tried a few years ago. Hi there, like the video, thanks! 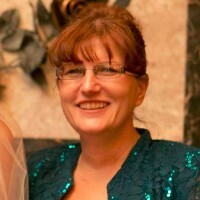 Question, I produce my own honey and my family consumes it raw for the added enzyme benefits. I would like to retain these enzymes thus would need to add the raw honey to the tea after it has cooled to below 117 degrees. Do you know if this will pose any problems? Specifically, by adding the honey after the tea has cooled, am I possibly introducing toxins, bad bacteria, etc into the tea which may end up being present in the final kombucha? Using your honey recipe (3/4C honey per gallon), how many calories are there in a 12 or 16 oz glass, letting it sit 10 days? I know scoby eats most of the sugar. Does it eat most of the honey? I like using natural raw honey but I don’t like the calories. Thanks! I am sorry we do not know the calories because fermenting can be different from ferment to ferment due to temperatures and time. It does consume most of the honey. Can I use dried moringa leaves instead of tea bags? You could try a small batch with a little scoby in case it doesn’t work out.